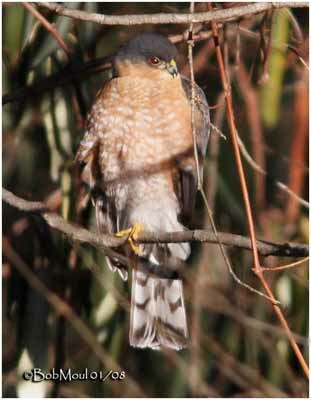 Sharp-shinned Hawk is distinguished from Cooper’s Hawk by its tail which is squared and notched when folded. Legs are thinner, and head and neck appear smaller than Cooper’s. Upperparts are bluish-grey, with dark crown. Underparts are white barred with reddish-brown. Short rounded wings are dark brown above, and whitish streaked with dark below. Tail shows dark horizontal stripes. Short bill is blackish with yellow cere. Adult eyes are red. Legs and feet are yellow, with median toe larger than others. Female is larger than male. She has fewer streaks on breast, and her plumage is rather brownish than male. Juvenile are streaked and have paler colours than adults. It shows thin white stripe and yellow eyes. 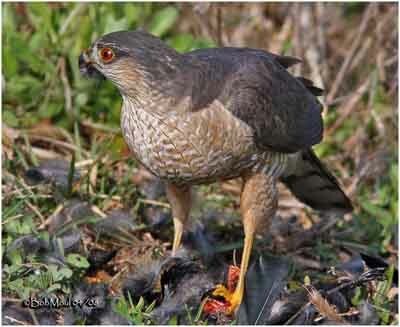 Sharp-shinned Hawk’s call is a series of “kik-kik-kik” or “kek-kek-kek”, but it is usually silent. Vocalizes occur during breeding season. Near the nest, male utters “kip-kip” or “kew-kew-kew” and female replies “keeeep”. Nestlings give “eee” at nest. Sharp-shinned Hawk lives in mixed woodlands. It is a forest bird. It can be found near suburban and cultivated areas, and in forests. It breeds in deciduous or evergreen forests, in mountainous areas, from 500 to 3000 metres elevation. 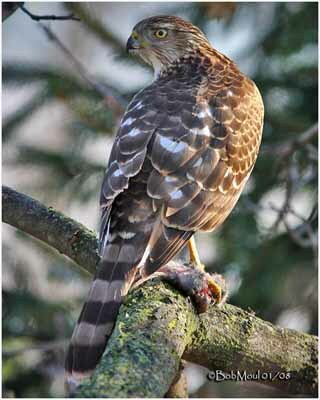 Sharp-shinned Hawk lives in most of parts of North America and Mexico. They also are found from Venezuela to northern Argentina. They migrate to the south of their range in winter. Sharp-shinned hawk is territorial during breeding season. It responds to intruders by calling, or chasing and attacking. It may migrate in small groups, but it is often solitary. North American populations move to south in winter, and they fly distances up to 1500 km. 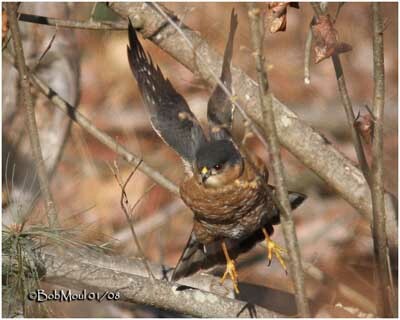 Sharp-shinned Hawk hunts from a perch, or captures birds by low approach flight, or chasing them. To conceal the approach, it uses cover. It also hunts its prey on the wing. It grabs onto prey with its long talons, and its high-speed flight helps it to catch the prey. It plucks it before eating. It often hunts at bird feeders, and catch young from nests. It is active during the day and very secretive. Its mating behaviour is little known, but they perform flight displays and they are monogamous. Male and female may perform slow flight territorial displays, flying with slow and exaggerated wing beats, and exposing their white undertail coverts. They utter “kik-kik-kik” while flying. When young have fledged, they are fed by parents in mid-air. Adults give prey to the first young to reach it. They hover and keep the prey outwards when young arrive. 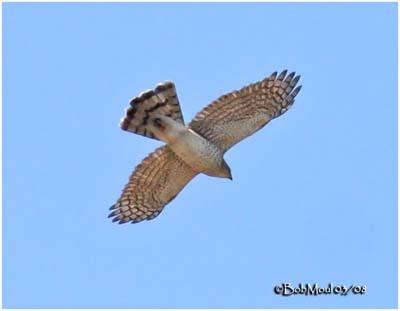 Sharp-shinned Hawk usually flies below the canopy, steering with its tail. It has very agile flight, and it is able to fly through the forest, although it hurts its breast against branches. During migration, it uses alternately wing beats, glides and soaring. Sharp-shinned Hawk builds its nest in dense trees, often below canopy. Both adults collect nesting materials, but female builds the platform nest. Nest is made with fresh twigs and lined with bark chips. Nest is used year after year, and sometimes when nest becomes too old, adults build another nest above it. Nest is situated between 20 to 60 feet above the ground. Female lays 4 to 5 white or bluish eggs, spotted with dark. Incubation lasts about 21 to 35 days, by female, often fed by the male while at nest. Chicks hatch within one or two days of each other. They are altricial, and female broods them during 2 or 3 weeks. They fledge at about 21 to 32 days, males sooner than females. Young are fed by parents during about 25 days after fledging. They reach their sexual maturity at two years. This species produces one clutch per year. 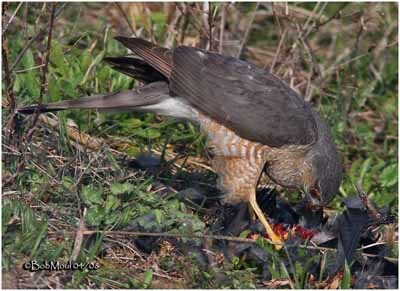 Sharp-shinned Hawk feeds mainly on small birds, but it also consumes large insects, small mammals, lizards and frogs. Sharp-shinned Hawk has some predators, such as Bald Eagle, Peregrine Falcon and Northern Goshawk. 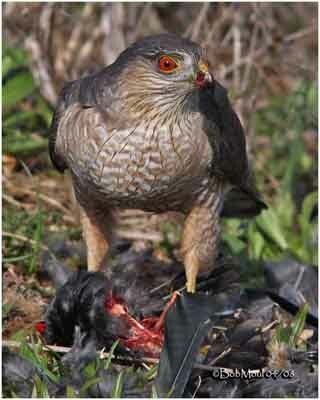 Sharp-shinned Hawk’s populations have declined with the use of pesticide DDT, causing eggshell thinning. But today, their prey species are also declining, and fragmentation of forest habitat and habitat loss threat the Sharp-shinned Hawk species.